Roots of Fire performed at Luton Library on 10th November 2017. Supported by the Bagri Foundation and Arts Council. 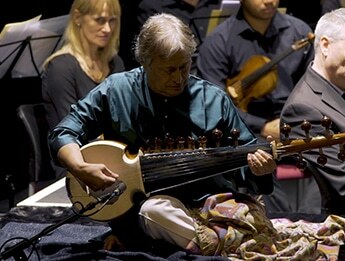 Building on the experience of their work together on Samaagam in 2011, a new work, Roots of Fire was created by Amjad Ali Khan and David Murphy in 2017. This piece was composed including musical material produced by children aged 10-11 in a large-scale series of school workshops across Luton, Slough and Leicester in the UK. The 40-minute work can now be programmed by any chamber orchestra, combined with other works which complement and inspired its creation. The large-scale education workshops that combine with Roots of Fire can be repeated in any community. Working with children and local musicians, Murphy and the orchestra explore musical collaboration through the fusion of Eastern and Western traditions.